No More Torture: World’s Largest Group of Psychologists Bans Role in National Security Interrogations | Democracy Now! professor at the Boston Graduate School of Psychoanalysis and co-founder of the Coalition for an Ethical Psychology. president-elect of the British Psychological Society. By a nearly unanimous vote, the American Psychological Association’s Council of Representatives voted Friday to adopt a new policy barring psychologists from participating in national security interrogations. The resolution also puts the APA on the side of international law by barring psychologists from working at Guantánamo, CIA black sites and other settings deemed illegal under the Geneva Conventions or the U.N. Convention Against Torture, unless they are working directly for the persons being detained or for an independent third party working to protect human rights. The vote came at the APA’s first convention since the release of a report confirming the APA leadership actively colluded with the Pentagon and the CIA torture programs. The sole dissenter was retired Col. Larry James, former top Army intelligence psychologist at Guantánamo and Abu Ghraib. We play highlights from the vote, including APA President-elect Susan McDaniel, and speak with two of the leading dissident psychologists who have been pushing the APA to reverse its stance on interrogations for nearly a decade, Steven Reisner and Stephen Soldz, founding members of the Coalition for an Ethical Psychology. We also speak with the president-elect of the British Psychological Society, Peter Kinderman. AMY GOODMAN: By a nearly unanimous vote, the American Psychological Association’s Council of Representatives voted Friday to adopt a new policy barring psychologists from participating in national security interrogations. The resolution also puts the APA on the side of international law by barring psychologists from working at Guantánamo, CIA black sites and other settings deemed illegal under the Geneva Conventions or the U.N. Convention Against Torture, unless they’re working directly for the persons being detained or for an independent third party working to protect human rights. The vote came at the American Psychological Association’s first convention since the release of a report confirming the APA leadership actively colluded with the Pentagon and CIA torture programs. For the past decade, a group of dissident psychologists have protested the involvement of psychologists in interrogations at CIA black sites and Guantánamo and moves by the APA to rewrite the organization’s ethics policy. For years, the dissidents had been ignored and ridiculed. But that all changed with the recent release of the “Hoffman Report,” a 542-page independent review commissioned by the APA’s board of directors. The study undermined the APA’s repeated denials and confirmed some of the APA leaders were complicit in torture. Following the release, four top APA officials resigned, announced early retirement or were forced out. Democracy Now! was in Toronto to capture the historic American Psychological Association vote on Friday. Here are some highlights in the minutes before the vote. This is APA President-elect Susan McDaniel. SUSAN McDANIEL: We’re here today to reset our moral compass and ensure that our organization is headed in the right direction. As I said on Wednesday, I believe in psychologists’ capacity to make the world a better place. We’re here today to decide how to do that. And next in order of what you, Council, saw as priorities is the prohibition on psychologists’ participating in interrogation in military or intelligence context. Dr. Reisner? STEVEN REISNER: This new substitute motion is here to rectify 10 years of deceitful and underhanded and secret collusion to impede the will of the membership. So what we are doing and what we added—and we added this in full collaboration with the board, the non-recused board—is to rectify that, which is why this, once and for all, puts a prohibition on psychologists being involved in those national security interrogations, as all other health professionals are prohibited from that. It doesn’t stop training, in general, about what makes for a non-harmful interrogation. It stops us from being involved in these abusive circumstances. It puts our moral compass right. ALI MATTU: Ali Mattu, speaking for Division 53, clinical child/adolescent psychology. And I want you to take a very clear look, right here, right now. We know the Milgram research. We know if you push off the humanity of another person, it is easy to engage in torture. But this is the face of people who were tortured. It is people of my race, of my ethnicity, of my faith, that were silenced and tortured by psychologists in the name of APA policies. And this is a time to act and correct our course. And everyone out there in the galley, in the peanut gallery, as we so affectionately call it, thank you for coming here, and thank you for setting our moral compass right. EMILY VOELKEL: Emily Voelkel, here representing the student constituency as APAGS chair, also board of directors. Christine, my colleague, spoke yesterday to a survey that we had. I’m quoting here: “I chose to study psychology because I perceived it as a field that shared my values of social justice. After reading the report, I felt personally and professionally betrayed,” end-quote. Next quote: “My reaction was one of concern, but I was not surprised.” We should be ashamed that our students are not surprised by these actions. LARRY JAMES: Good morning, Dr. McDaniel. Larry James from Division 19, Society of Military Psychologists. Gosh, I get it. Abuse, human rights, no torture—who’s going to disagree with that? But I’m worried about second-, third-order effects, unintended consequences. So, I need to know: Does international law supersede U.S. law? Because if the answer to that is yes, this has dire negative consequences for all federal employees, particularly in the VA and the department of homeland defense. DOUGLAS HALDEMAN: Good morning. Doug Haldeman, Division 42, Psychologists in Independent Practice, and also the chair-elect of the Council Leadership Team. What is torture? You know, we’ve spent a lot of the last decade talking about torture as if we knew what it was. But there’s actually a lot of fine print involved in the resolutions that we’ve adopted about torture and a lot of fine print that I suppose most of us, I hope—all of us, I hope—would not agree with, which actually means that we have unwittingly, tacitly, consciously even, supported the Bush administration’s manipulation of the definition of torture in such a way that it constitutes inhumane, degrading and cruel treatment and punishment. This resolution corrects that and brings us in line with the Geneva Convention and the international definition of torture. SUSAN McDANIEL: So now we’re voting on the main motion. The secretary will call the roll. JENNIFER KELLY: That’s it, ladies and gentlemen. SUSAN McDANIEL: The motion passes. AMY GOODMAN: That was Friday’s historic vote by the American Psychological Association barring psychologists from participating in national security interrogations. Retired Colonel Larry James cast the sole dissenting vote. He was the former top Army intelligence psychologist at Guantánamo. He was also at Abu Ghraib. Moments after the vote, I spoke to the two leading dissident psychologists who have been pushing the APA to reverse its stance on interrogations for nearly a decade. AMY GOODMAN: And your position? STEVEN REISNER: I’m a member of council of the APA, and I’m a co-founder of the Coalition for Ethical Psychology. AMY GOODMAN: Can you explain what just happened? STEVEN REISNER: What just happened is that after nine years of collusion and deceit between the American Psychological Association and the Department of Defense and the Bush administration, after nine years of what has now become a major scandal, the APA council, the APA—sorry, the APA council turned that around. The APA council acknowledged that it had been led down a deceitful path, that all of our policies in the past, which claimed to uphold human rights, were shams. But today, for the first time, we passed a real policy that upholds human rights and prohibits psychologists from being involved in any way in torture, cruel, inhuman or degrading treatment, insofar as those are part of national security interrogations, in detainee conditions. Any way that our national security apparatus abuses detainees, we have said that we are opposed to that. We demand human rights be applied in all cases and that no psychologists will ever participate in any detention camp, in any interrogation, in any of that, because there are abuses going on, and we want to stop those abuses. AMY GOODMAN: Who determines whether it’s inhumane? What is the resolution that was passed? STEVEN REISNER: Well, there are two parts. First of all, it simply holds a bright line against any psychologist being involved in any national security interrogations or detention conditions. It’s a bright line. So it doesn’t matter who determines it or not. So there’s that. But second, what we did was we took the decision on what is the judgment on what is torture, cruel, inhuman and degrading treatment away from U.S. law, away from the United States’ reservations to the United Nations Convention Against Torture, and aligned APA standards with international standards, with the United Nations convention, with the United Nations Committee Against Torture, with what the U.N. rappateurs against torture and rapporteurs for human rights—what they say is now APA policy. We bow to their international human rights judgment, and we will follow it. AMY GOODMAN: And what is a national security interrogation? STEVEN REISNER: A national security interrogation is—we defined it. It’s any interrogation, or any conditions of confinement in support of an interrogation, that takes place outside of the protections of domestic criminal law. So it could be for the DOD. It could be for the FBI. It could be for the CIA. It could be in black sites. It could be foreign governments that do interrogations on our behalf. It could be private contractors. We have prohibited psychologists from being involved in any of those. The only exception has to do with domestic law enforcement, where constitutional law, Miranda rights apply, that we carve that out for the time being. We are fully aware that abuses go on domestically, as well, and we are very concerned about that. 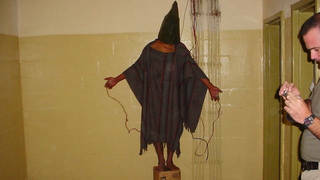 But this particular issue has to do with the fact that psychologists were responsible for our nation’s torture program. And now the APA is no longer supporting psychologists in those roles, but actively and clearly opposing any possibility of psychologists playing those roles. AMY GOODMAN: And what if someone does participate? What does that mean? What does it mean to pass an APA, an American Psychological Association, resolution? STEVEN REISNER: Well, that would be very serious now, because this resolution is implementable. We are moving to our ethics committee to make sure that such people will be held accountable for ethics violations. If someone is held accountable for an ethics violation at the American Psychological Association, that is in turn taken very seriously by state licensing boards. So, for people to violate this resolution, their license could be on the line. So I’m just—I’m going to put it, though, in the other way: What this does is it protects psychologists in the military, in national security settings. It lets them know that they have the APA behind them when they refuse to participate in any torture, cruel, inhumane or degrading treatment. We have their back. They are obligated to refuse, and we will support them. AMY GOODMAN: Can a psychologist participate in any CIA or Pentagon interrogation? STEVEN REISNER: No. At this point, a psychologist cannot participate in any such interrogation whatsoever. AMY GOODMAN: And so, how many psychologists does that affect? STEVEN REISNER: We don’t actually have the exact number. I don’t think it’s thousands. I think it’s probably hundreds. But I am glad to say that, for them, it is now clear what their ethics responsibilities are, and they will now represent psychology in a way that we can all trust. And I’m hoping that this is a huge step toward the profession regaining the public trust, which is what we have to do. AMY GOODMAN: Is there anything else you want to accomplish here at this APA meeting? STEVEN REISNER: Well, there are many things I want to accomplish at this APA meeting, but I am totally satisfied with this one. AMY GOODMAN: And, Stephen Soldz, your response? You’re wearing a button that says? STEPHEN SOLDZ: “First, do no harm.” This is the result of nearly a decade of effort by hundreds and thousands of people. We are—we’ve been spokespersons, but there have been many, many, many people involved in this. And when the membership of the APA spoke in 2008 in a referendum, they voted 59 percent to get psychologists out of Guantánamo and CIA black sites, but a small group of APA insiders undermined that. This reverses that, after seven years of deceit. So, it’s a victory for our movement. But I also want to emphasize that it’s a victory for the anti-torture movement, that the APA has moved from being complicit in the state-sanctioned torture to being among the leaders in dealing with state-sanctioned torture and taking strong policies and moving its members out and taking at least a beginning level of accountability for the people in the association who were involved in this. And so I think the APA moves from the back of the pack to being a model for other parts of society about how to deal with this. AMY GOODMAN: And can you talk about the organizing that it took to get to this place after almost a decade? STEPHEN SOLDZ: Well, it was basically—for many of us, it was basically our life for the last decade. We—writing hundreds of articles; organizing psychologists; making alliances with human rights groups, alerting them to what was going on; working, like Steven did, within APA and getting on the APA council and Jean Maria Arrigo on the APA council; working outside to alert the public; working with reporters; getting the public and the APA leadership to realize that this was a major issue, that this was a scandal that could not be allowed to stand. And, you know, it takes involved people and dedicated people, and we had a lot of them. AMY GOODMAN: Steven Reisner, would you like to add to that? STEVEN REISNER: Yes, I just want to—I just want to say how grateful we are to the entire community that we worked with. We have our talents, but there are enormous talents that it required—that are required to change the world. And when talented people get together and are dedicated to good, to human rights, human welfare, to change—using our skills, our individual skills, for good, it may take 10 years, like this one did, but this shows that it is possible to make a significant change. Because right now, even the Obama administration is on notice that the American Psychological Association is opposed to some of the policies that are still in existence. For example, the interrogation policy of the Obama administration includes the Army Field Manual Appendix M. That appendix uses techniques or permits techniques that have been banned by the U.N. Committee Against Torture. Today, the American Psychological Association is saying to the Obama administration that we consider that cruel, inhuman and degrading treatment, and none of our members can participate in any of those activities; it’s time for you to change that Army Field Manual; it’s time for the United States to follow the American Psychological Association and ban any technique, any condition that is considered still to be torture, cruel, inhuman and degrading treatment. We want to lead the way and have the Obama administration follow us. AMY GOODMAN: How many people are on the council? AMY GOODMAN: That person opposed? STEVEN REISNER: That person opposed was Larry James. And Larry James has been a strong voice to keep psychologists in those settings, in the interrogation room. And he once—he was part of, you know, the—he was part of the group that bent the American Psychological Association’s rules, I would say, and policies, in a way that was secret and, I would say, part of what the Hoffman investigation interrogated. But that doesn’t mean that he doesn’t actually have his own strong feelings about that, which he expressed. STEVEN REISNER: He worked at Guantánamo. He was supervising these interrogations. AMY GOODMAN: And he’s now at Wright State in Dayton, Ohio. AMY GOODMAN: There were a few abstentions. STEVEN REISNER: There were a few abstentions. There were a few recusals. But we voted overwhelmingly in favor, and he was the lone voice against. AMY GOODMAN: Why was this so important to you personally? Why did you wage this 10-year battle? STEVEN REISNER: Well, I come from a family where people were tortured in the Holocaust. I have seen what happens when standards of decency, human rights and ethics are thrown out in a wave of totalitarian or government zeal. I have seen what happens when you have a government that turns to the dark side and breaks all the rules in favor of doing whatever they want. And I have spent my life trying to uphold those standards, trying to make it—I’m a psychologist because I believe we answer to an authority that—of what is right, not what is law, because what is law can be twisted and do evil. But so, this particular fight, when I saw that psychologists were part of this, that psychologists using their expertise strategically to help torture and abuse, that psychologists were behind this, I knew I had to speak out. And I did. I didn’t expect it to lead to this. I just, you know, spoke out. I’m a psychoanalyst. I usually sit behind the couch silently. But I needed to speak out. And then we joined together with a group of people who spoke out, who felt the same way, and we made the change. AMY GOODMAN: And, Stephen Soldz, for you, personally, why this was so important? STEPHEN SOLDZ: Well, I kind of wandered into it by writing an article on the APA. But it became clear after a while that if a small group of people didn’t really keep the struggle up, they were going to get away with it. And when I was a kid, my hero was Henry David Thoreau, who sat in a jail cell, maybe only for a night, because he was opposed to slavery. And the image of standing up—and as I explained to my wife sometimes when I would be preoccupied, when I should have been paying more attention to her and my family, I said, “I just can’t be one of those who doesn’t stand up when I have the opportunity. I can’t live with myself if that’s the case.” I’ve always admired those who did. This was my time to do it. And I knew that if a few of us didn’t keep it up, this policy would keep on. And couldn’t live with that. AMY GOODMAN: Do you feel like you made history today? AMY GOODMAN: Psychoanalysts, Drs. Steven Reisner and Stephen Soldz, founding members of the Coalition for an Ethical Psychology. Following the American Psychological Association vote to ban psychologists from national security interrogations, I also spoke with the president-elect of the British Psychological Society. PETER KINDERMAN: So I’m Peter Kinderman. I’m president-elect of the British Psychological Society and representing them here at APA. And thoughts for today? I think it’s wonderful. I think it’s great. I think it’s well overdue. I was joking earlier that this represents American psychologists rejoining the 17th century and repudiating torture as a means of state power. And, yeah, I think that there’s an element of “about time,” but I think it’s great. As I read it, the agreement is that American psychologists would respect agreed international definitions of the abuse of detainees and agreed international standards for judicial process. We shouldn’t be involved in abusing detainees, and we should remain within domestic and international law. That strikes me as commonsense, obvious. It’s what the public would expect. And about bloody time, too. AMY GOODMAN: That’s Peter Kinderman, president-elect of the British Psychological Society, speaking in Toronto, Canada. To see all of our coverage of the historic APA vote, you can go to our website at democracynow.org. When we come back from break, we’ll talk about what’s happening here in Venice, Italy, the oldest biennial art exhibition in the world. We’ll talk politics and art. Stay with us.